How a tailor discovered Tanzanite, one of the world's favourite gem stones | Is This Mutton? If you've read all the previous articles on Is This Mutton?, you'll know that most of the birthstones have been around for centuries and are steeped in traditions and lore. Although it was a recent discovery, tanzanite has already become the second most popular blue stone after the sapphire. The gemstone was discovered in 1967 by Manuel d'Souza, below, a tailor and part-time gold prospector, in the Manyara Region in Northern Tanzania. D'Souza was from the Indian province of Goa and was prospecting for rubies. He was led to a deposit of blue stones by a Masai tribesman. Taking it home, he realised the gem was too soft to be a sapphire, and decided the closest thing in his gem reference book was olivine. 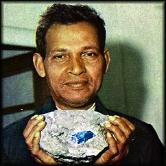 He registered a claim with the Tanzanian Government on July 25th 1967 to extract olivine. Soon after registering his first claim, Manuel returned with a small team and began a small-scale operation, taking with him noted geologist Dr John Saul. He saw the astonishing blue gem, labelled ‘dumortierite’ at the time, and quickly eliminated dumortierite and c-cordierite as possibilities. He then enlisted the help of his father, Hyman Saul, to identify the gemstone. Hyman was vice-president of luxury American store, Saks Fifth Avenue. He took samples to the Gemological Institute of America. They discovered that the gem was not olivine or dumortierite but a variety of zoisite which featured elements of vanadium (hence its colour). The gemstone made its way into the hands of Tiffany and Co, who chose to market the stone under the name tanzanite. The original name sounds like "suicide". They launched it in 1968, describing it as 'the most beautiful blue stone discovered in over 2000 years'. Tanzanite is one of the birthstones for December, along with zircon, turquoise, and blue topaz. Tanzanite is also the gem for a 24th anniversary. According to jewellery retailer Gemporia, part of this stone’s unique appeal is that it is pleochroic. This means it displays two striking colours as it interacts with the light. One is a midnight blue and the other is a piercing flash of pink deep. As you inspect your blue to violet coloured gemstone, it seems to blush with the attention. Gemporia only let the world’s finest lapidarists cut and facet tanzanite and say they always cut Tanzanite for beauty and not to maximise its carat weight. As with many of the other gemstones, the quality of a tanzanite is measured by the four C's, colour, clarity, cut and carat weight, although there isn't a global standardised system for this. Most retailers use a special grading system for tanzanite, the A grading system, which classifies the gemstone A, AA, AAA or AAAA depending on the intensity of the saturation, and the depth of the tone. 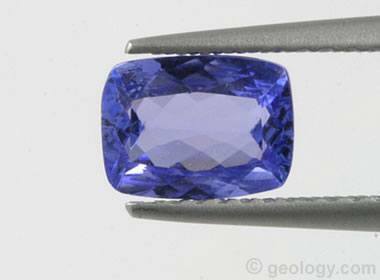 A deep saturated blue is the most valuable colour of tanzanite. Paler tones are more affordable. Eye-visible inclusions decrease the value of tanzanite, particularly in lighter coloured stones. Tanzanite is available in a wide range of shapes but cushion and oval cuts are most common. To have fine colour, gems are usually above five carats in size. Smaller sizes of stone tend to be less saturated. It's worth pointing out that similar to blue topaz, tanzanite is often colour treated or irradiated to improve the blue / violet hue. There are also some variations of colour in tanzanite which account for less than 10 per cent of all tanzanite mined. These are technically known as 'Fancy Zoisite' by gemologists and they're around 10,000 times rarer than a diamond. The fancy colour you are most likely to come across is a greenish-blue. Trade names for these extraordinary gems include 'Bi-Coloured', 'Chameleon', 'Peacock', or 'Ocean' Tanzanite. You will sometimes find colours that are similar to a peacock feather – a mixture of blues, greens, and purplish-pinks. You may also come across Tanzanites that are much more green than blue. Hardness is the resistance of a gem to being scratched. Tanzanite has a hardness of about 6.5 on the Mohs Hardness Scale. This hardness is low enough that the gem is vulnerable to being scratched during normal wear if it is used in a ring. Tanzanite is best suited for earrings, pendants, and other jewelry items that will not encounter abrasion and impact. It is less suited for use in a ring. 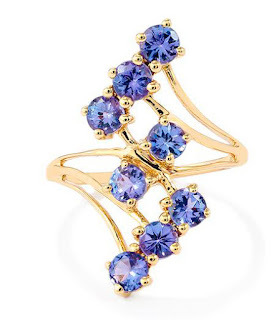 Many jewellers recommend that "tanzanite rings are for dress rather than daily wear." Although tanzanite is as hard as titanium, it is a crystal and therefore quite brittle. You should always protect your tanzanite jewellery from hard knocks and sudden changes in temperature. It is also advisable to avoid ultrasonic cleaners. The safest way to clean tanzanite is with soapy, hand-warm water and a soft cloth, rinsing well and patting dry afterwards. Store tanzanite in a jewellery case away from other gemstones or diamonds to avoid it getting scratched. Emerald, Aquamarine, Diamond Pearl, Ruby, Peridot, Sapphire, Opal, Topaz. Read more about the discovery of tanzanite at Gemporia. Don't miss a post - follow my blog on Bloglovin or Feedspot, and receive a weekly email on my updates. You'll love "shoe of the day" on the Is This Mutton? Facebook page. And check out the Is This Mutton? Pinterest boards, including boards on other bloggers in fab outfits plus hairstyles, handbags, nails and fashion picks. Oh, that beautiful blue. Just love that ring but if this stone is brittle, I would be so worried wearing it. Used to have an opal ring that was almost too delicate to wear everyday. And I am hard on jewelry anyway. Once had my engagement ring cleaned at a jewelry store and the gal asked if I was a housekeeper because my ring was so dirty! I have a tanzanite ring - I meant to include a photo but took lots and they were all out of focus. I wear it occasionally as a dress ring, and it always gets lots of compliments. So if you love the colour of the stone (and it's amazing) don't let the softness of the stone put you off. It just means you can't wear it all the time as you might with diamonds or sapphires.